Adrion Smith first came to the CFL as a free agent signing by Hamilton in 1994. Smith was traded to the Memphis Maddogs along with cornerback Gary Wilkerson and defensive back Don Odegarde for Memphis's first two picks in the Los Vegas Posse dispersal draft (Anthony Calvillo and Don Robinson). After the folding of the American teams, Smith wasa free agent and signed with the Torotno Argonauts where he remained for ten seasons from 1996 to 2005. 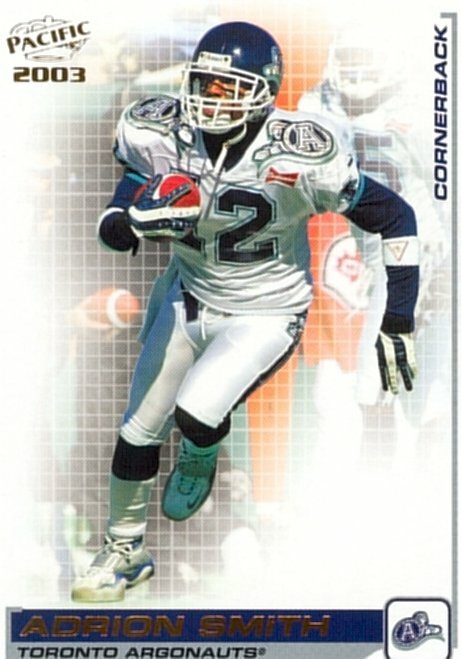 Smith did leave the Argos in 1998 as a free agent signing with Buffalo, but returned to Toronto after being released by the Bills. Smith was part of a very good Toronto secondary and won six East All-Stars in ten year (1996, 1997, 1997, 2002, 2003 and 2005) as well as two CFL All-Stars (1999 and 2003). Smith had 49 career interceptions, returning five of those for touchdowns. Smith added three more touchdowns on fumble returns and had a 94 yard punt return for a touchdown while with Memphis in 1995. Also, in a bit of an oddity, Smith was inserted at quarterback by the Argos for a few plays in 1999 and completed both pass attempts he threw, including one for a touchdown. Smith played in three Grey Cup gamesand won all three (1996, 1997 and 2004).